Two sexual assault survivors on Friday confronted Sen. Jeff Flake (R-AZ) over his plan to vote to confirm Judge Brett Kavanaugh. The two women stormed Flake as he was attempting to get into an elevator to make him listen to their story. "I told the story of my sexual assault. 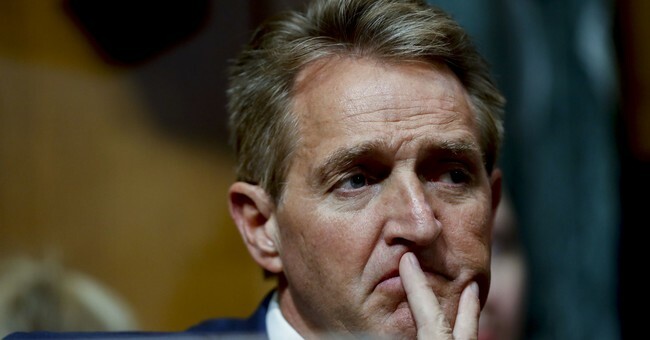 I told it because I recognize–" Ana Maria Marchilla screamed at Flake. "I need to go," Flake said. "–that she's telling the truth. What you are doing is allowing someone who actually violated a woman to sit in the Supreme Court," Marchila said tearfully. "This is horrible. You have children in your family. Think about them! I have two children and cannot imagine that for the next 50 years they will have to have someone in the Supreme Court who has been accused of violating a young girl. What are you doing, sir?" "I was sexually assaulted and no one believed me!" a voice from behind the camera screamed. "I didn't tell anyone and you're telling all women that they don't matter, that they should just stay quiet because if they tell you what happened to them, you're going to ignore them. That's what happened to me and that's what you're telling all women in America, that they don't matter, that they should just keep it to themselves because if they had told the truth you're just going to help that man to power anyway. That's what you're telling all of these women. That's what you're telling me right now." Flake was looking at the elevator floor while the two women berated him. "Look at me when I'm talking to you!" the woman behind the camera cried. "You're telling me that my assault doesn't matter, that what happened to me doesn't matter and you're going to elect people who do these things into power." Here's the problem: The first woman, Ana Maria Marchila, is the co-executive director of the Center for Popular Democracy Action, a progressive organization who works in "partnership with high-impact base-building organizations, organizing alliances, and progressive unions." The group touts their desire to "win an innovative pro-worker, pro-immigrant, racial and economic justice agenda." Of course, she also used the opportunity to promote her progressive organization. She even used her connections to write an opinion piece in USA Today entitled, "I confronted Jeff Flake over Brett Kavanaugh. Survivors like me won't stand for injustice." In the middle of her OpEd she admitted the real reason she opposes Kavanaugh's confirmation — and guess what? It has pretty much everything to do with Roe v. Wade and a "woman's right to choose." On Monday, I was with the organization that I co-lead, the Center for Popular Democracy Action, and hundreds of people from across the country who came to D.C. to urge their senators to vote no on the Kavanaugh nomination. For weeks people have traveled to D.C. to tell their stories trying to secure and save their health care, exercise their right to vote and, more recently, survive. People came to tell their survivor stories, discuss how Kavanaugh’s judicial record would harm working people and to urge their senators to vote against the nomination. Now the million dollar question: what were Ana Maria Archila's real motivations behind this publicity stunt? Was it to get Flake to flip his vote? Was it to promote her progressive organization (especially since she says they don't get big funding)? Was it to "stand in solidarity with Dr. Ford" and Kavanaugh's other accusers?